Istanbul’s heritage of natural and historical beauties lends it a spectacular silhouette. So much so that while it takes tourists’ breaths away, it also never fails to impress its inhabitants. In this article, we will tell you about quality restaurants where you can have the perfect dining experience against the backdrop of this beautiful silhouette. Here are 8 restaurants with an amazing view that should always be on your radar, whether it be for an anniversary dinner with your loved one, or a business dinner. Located in Sultanahmet, Fine Dine Istanbul is a stylish restaurant where you will enjoy having dinner to the accompaniment of Istanbul’s legendary silhouette. Prepare to be impressed by the breathtaking view of the venue that extends from the Bosphorus bridge to the Hagia Sophia, Sultanahmet, and Haydarpaşa. Moreover, it has a rich menu that offers a variety of tastes. Armada Terrace is another restaurant that offers its guests a stunning view as well as delicious food. With its upbeat and professional staff, you can have a pleasant dining experience at the venue that commands an awe-inspiring view of the Marmara Sea, Kadıköy, the Princes’ Islands extending to the Blue Mosque and Hagia Sophia. Located in Eminönü, Hamdi Restaurant is one of the go-to-addresses for an authentic kebab experience in Istanbul. Opened nearly 20 years ago, the place is famous for its delicious kebabs as well as its magnificent view. If you also wish to taste delicious food against the backdrop of the beautiful silhouette of Istanbul, we would definitely recommend you to try Hamdi Restaurant. Peninsula Terrace Restaurant in Karaköy is also one of those dining venues with an eye-catching view. For an unforgettable dining experience, choose Peninsula Terrace that offers its guests a spectacular view that reveals the magnificent silhouette of Istanbul and a selection of delicious meals. Let us also add that the venue’s terrace offers a commanding view of the Topkapı Palace, Hagia Sophia Museum, Galata Tower, the Golden Horn Historical Peninsula and the Bosphorus. Deniz Kızı in Çengelköy stands out with its magnificent view, rich cuisine and experienced staff. 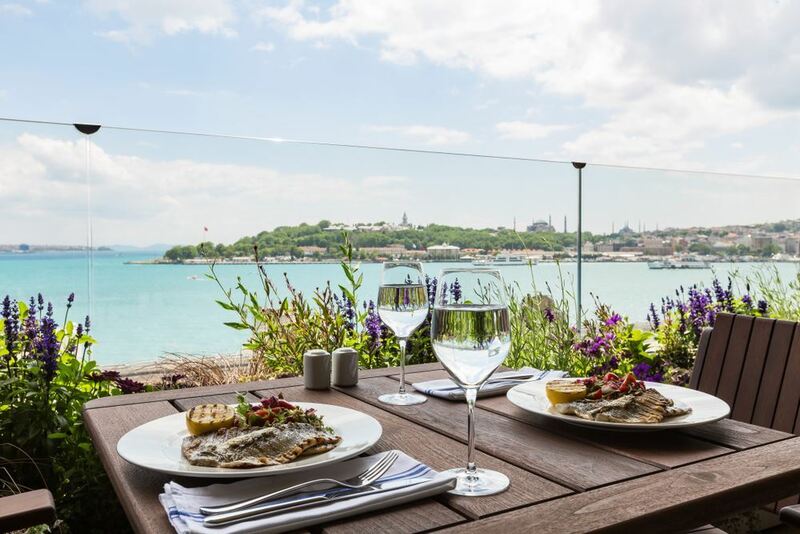 This pleasant restaurant with a terrace located in a wooden mansion on the seafront is ideal for those who wish to have a breathtaking view while enjoying their fish. 360 Istanbul, located in Taksim, is located on the top floor of the historical Mısır apartment building. Honored with many international awards, the venue is famous for its delicious food and its amazing view. If you wish to have a pleasant dining experience with a panoramic view of Istanbul, you should definitely give 360 a try. Located in Şişhane, Leb-i Derya is another venue where you can have a pleasant dining experience accompanied by a view of Istanbul. The view of the restaurant extends from the Bosphorus to the Historical Peninsula and blends good food with good music. The Grill Restaurant serving customers under the roof of Elite World Asia Hotel is a venue where you can have a fun dining experience against the backdrop of a wonderful view of Istanbul. The Grill Restaurant offers a variety of grilled meat dishes cooked in a coal fire and delicious appetizers, accompanied by a unique view of the islands and the sea. Choose The Grill Restaurant for an unparalleled dining experience and look at Istanbul from a different perspective.